← Previous Previous post: What, yet ANOTHER rebranding? A new car is always exciting. Looks great in the photo. What is “sports mode”? Sports mode is basically a version of manual gears – if you want to use it. Otherwise you can just use Drive (automatic). We bought a new Bosch a couple of months ago. We are happy with it. It is so quiet. It would be about the sixth dishwasher we’ve bought and the first time we have paid for installation. The car looks fine. The spoiler is maybe a little large but I think it might look a little odd without anything sitting there. You don’t need to have it serviced at the dealer from which you purchased the car. We bought a Mitsubishi from local dealer A who were OK with sales, but absolutely useless as a service department. 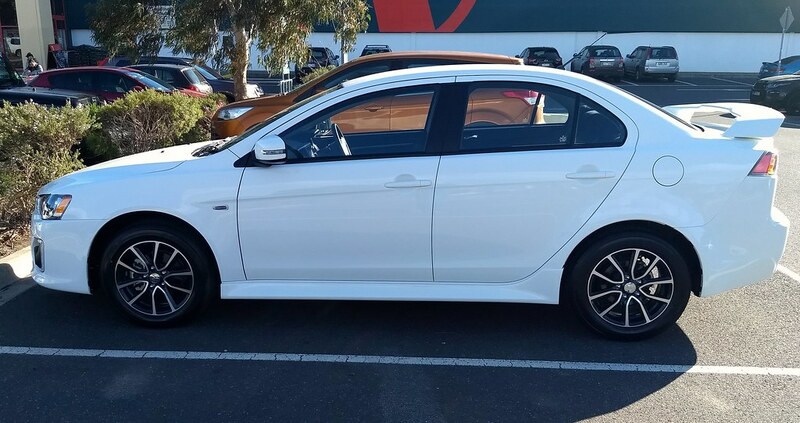 We tried Mitsubishi dealer B who were scam artists, and finally settled on dealer C who are honest and genuinely helpful (Eastside Mitsubishi). I usually try to carry my groceries inside my shoulder bag, backpack, or the plastic bags I took from the previous grocery runs. 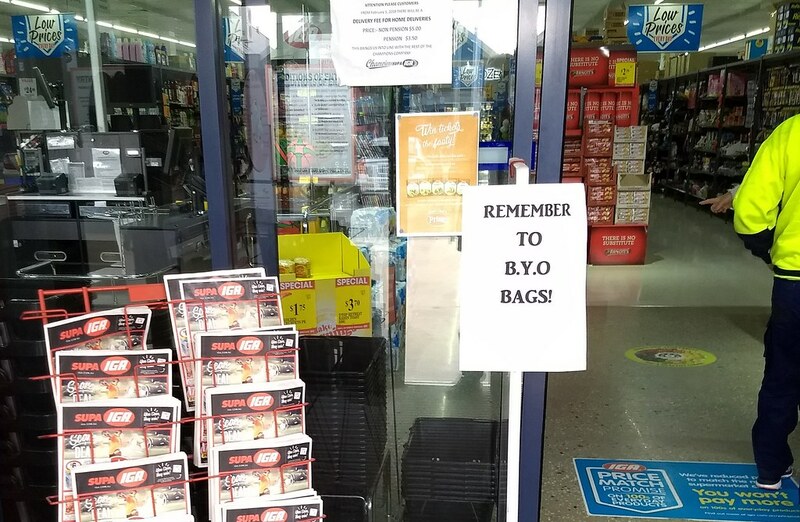 To be fair, it can be easy to forget to bring my own bag to the store. In Aldi, I learned quickly enough that if you forget your shopping bag, you can just grab a box from the box bin somewhere in the store. I’ve never had a staff member objecting me to using one of these boxes (where were going to get recycled anyway). KFC in Singapore encountered a similar outrage when they decided to get rid of plastic straws. A friend of mine complained that the prices of meals should be cheaper until I told him that straws can be bought for $1 for a pack of 100 retail and it is not workable to reduce everything by 1 cent. The supermarkets might have got rid of the grey bags, but I still have a handful of them stored near the washing machine, they will only get thrown out when they break. Smaller shops still have them anyway, notably the Chinese $2 shops and grocery stores (the bags are usually white rather than grey, but they are the same types). I also have a number of the 15c bags (and identical zero-cent bags from Cash Converters and the like) as well as the “green” bags. Straws at KFC aren’t really necessary as most KFCs use cans and bottles, if the remaining KFC restaurants which only serve postmix (hello Eastland) got rid of the undersized yet same priced paper cups they use*, there would be no point in offering straws at all. A straw doesn’t even fit in a 600mL Pepsi bottle (the only reason you can still use one is because it floats), and the KFC ones couldn’t be narrower anyway, it’s almost like drinking through a coffee stirrer (speaking of coffee, why the hell doesn’t KFC Australia do hot drinks anymore? It’s still available in the US, UK and probably every other country as well – they used to have coffee/tea etc. right into the 90s, although back then they used non-recyclable polystyrene cups for hot drinks, but losing the cups was still no reason to stop offering hot drinks though, the other restaurants have no trouble at all with paper coffee cups). *IIRC the “large” paper cups are 480mL vs. a 600mL bottle. Add a quarter of a cup (if not three quarters!) worth of ice as most places do (unless you ask for no ice) and you would be lucky to get a can’s worth of “large” drink for $4. I hate to think what a “small” is, but I doubt it is even close to a 375mL can even without ice (probably 240mL or 300mL). The price is the same at KFC regardless of whether it’s in a paper cup or a can/bottle, it’s just marketed as “small” or “large” (or is “small” called “regular”, I forget). The biggest waste is probably the all-in-one packaging KFC uses for the straw, spoon, napkin and refresher towel. Most people don’t even need a straw or a spoon but it’s there as part of the parcel (the spoon is pretty much only used for potato and gravy and the desserts but it’s not uncommon to see it with burger/fillet meals which don’t even need it, as not every item comes with a P&G e.g. Go Buckets and other sides like single burgers or chips). If Maccas and Hungry Jack’s suddenly got rid of straws, it would be a bit weird though as they do not offer pre-packaged alternatives to their postmix Coke products (Subway is probably the only major restaurant chain in Australia to offer both types in the same place). For the sake of inclusion, Red Rooster tends to only have cans and bottles. Well, it turns out that Maccas will bring out paper straws instead. Let’s hope that they don’t end up disintegrating within five minutes and becoming a new Coca-Cola flavour at the bottom of the cup.